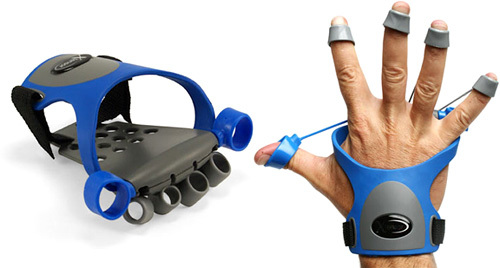 Xtensor Gamer Hand Exerciser | OhGizmo! And besides making you a better gamer (supposedly) the Xtensor also serves as an effective treatment for tennis elbow and even arthritis pain. All for just $39.99 from ThinkGeek. HA! I remember back when this device was originally marketed towards dentists and other professionals who were always holding small tools in a fixed way, in order to prevent repetitive stress and carpel tunnel. Awesome. That would make games way more fun!! !